Teaching children to tell the time can seem hard but with preparation, a consistent approach and useful resources it can also be enjoyable. Often we are wanting children to be able to tell the time way before they have the pre requisite skills to actually be able to do it. So understandably children can sometimes find it challenging and frustrating. What Time Actually is! In basic terms, children need to be aware of the concept of time- they need to understand past, present and future before they can even begin to start learning how to tell the time, otherwise it has no meaning to them. Talk to them about things that have already happened, things you will be doing tomorrow etc. This will help them to build their awareness of time. It can also be useful to help them understand time by reinforcing different times of day. For example, when it’s morning, lunchtime, afternoon and evening. As their understanding develops you can then start linking these times of day to numerical times of day too. Purpose of a Clock– This might sound obvious, but it’s important to explain to children what clocks and watches are for. Again, there’s no point starting to teach them to tell the time if they haven’t first been taught what a clock actually is. How Can you Make Learning to Tell the Time Easier for a Child? I believe that the way you teach them to tell the time and the resources you use are also key to helping children find it easier to learn. Over the last couple of months I feel really fortunate that we’ve been able to try out some fantastic resources for teaching children to tell the time. Both products were from Easy Read Time Teacher, who kindly sponsored this post. I’ve genuinely been converted to using their method. They have a 3 step teaching method that I can honestly say is a much easier way of learning to tell the time. What Makes Their Clocks Different and What is the 3 Step Teaching Method? 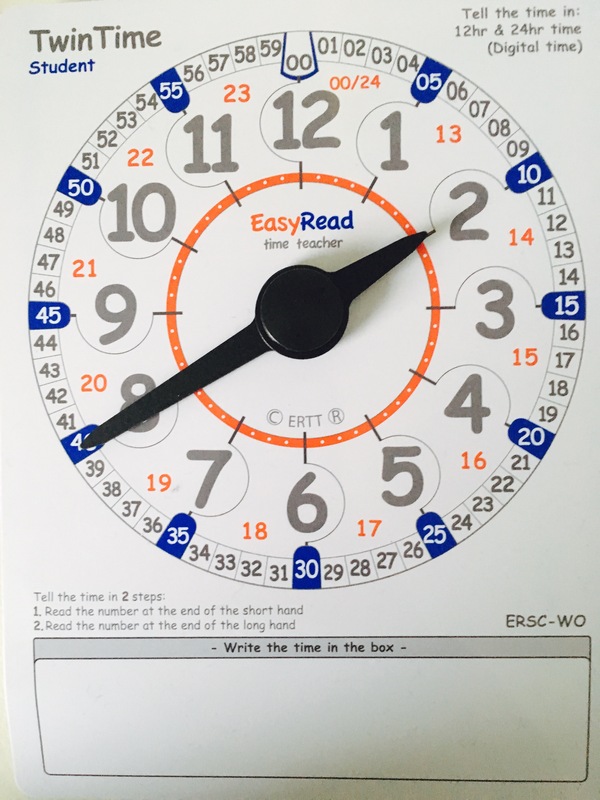 The EasyRead Time Teacher clock’s main difference from other clocks is that it comprises of two different coloured halves. One half has all the minutes past the hour (up to 30) printed on it. And the other half has all the minutes to the hour printed on it. Why does it Make Teaching time easier? 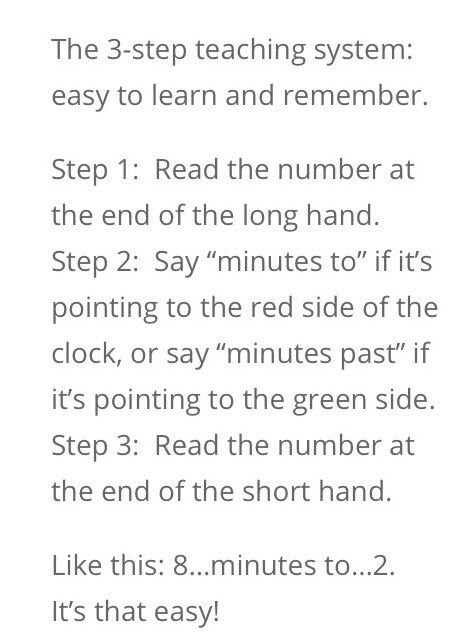 It means children can use the same process for telling the time when reading the minutes to the hour as they do when reading minutes past the hour. They don’t have to ‘work out’ how many minutes, but instead they just read it. For a lot of children, having a set rule of how to tell the time- makes it a lot easier for them to learn. Easy Read Time Teacher have a whole website packed full of various different clocks, watches and teaching Resources for in the classroom and at home. Easy Read Time Teacher Watch Review. To support teaching to tell the time they also have developed the Student Card, which is a small, very portable, PVC wipe clean write on board with a plastic clock face that you can adjust the hands of. This resource enables a teacher or parent to write a Time down for the child to then position the clock hands in the correct, corresponding place. An engaging and interactive way of checking a child’s understanding of telling the time. The Student Card also enable you to extend their learning further, providing them with increasingly difficult times to display on the clock. You can also swap roles and encourage the child to write down the time displayed, not only does this stretch their understanding further but it also helps them to link their skills to telling the time using digital clocks. ﻿* Please note this post is sponsored and we received sample products for review, however as always, all thoughts and opinions are our own. This post also contains Amazon Affiliate Links, for more information please see our About Me Page. I feel much more prepared to teach ‘time’ after reading your blog and loving the resources you recommend.